Recently I took up a new challenge, hill walking. I’ve ran in the mountains for years but never really gone for a long hike. You know the crowd, out with their poles, waterproofs, compasses, flasks, boots and those shoe cover things to keep your feet dry. Timing was good – I signed up over 6 months ago when a friend suggested this charity hike in the Comeraghs, the Fei Sheehy Challenge. It was down near home and a good cause, plus we’d get to catch up with a long chat. Entry fee paid, so I was committed, and then I forgot about it for about 6 months. The hike involved a 36km (22 mile) traverse of the Comeragh Mountains, with about 1,500m of elevation gain. The hike started at an early 7 AM up a quiet country lane near Dungarvan. We got there early but saw no sign of life. So I re-read the instructions and promptly realized we’d gotten the start point wrong. Everyone was being bussed from Clonmel (the finish), which made sense as no logistics of picking up your car after. So not a great intro (read the brief carefully next time). I figured the hike would take most of the day probably till 2 or 3 o’clock (7 or 8 hours). The pace was brisk, not a gentle walk, as I would had expected. These people didn’t hang around. People from clubs walked together, sometimes chatting, some in single file. People on a mission with the common destination in mind. I liked fact people were open and friendly but nonetheless independent. No support on course – bring all your food, drink and gear. 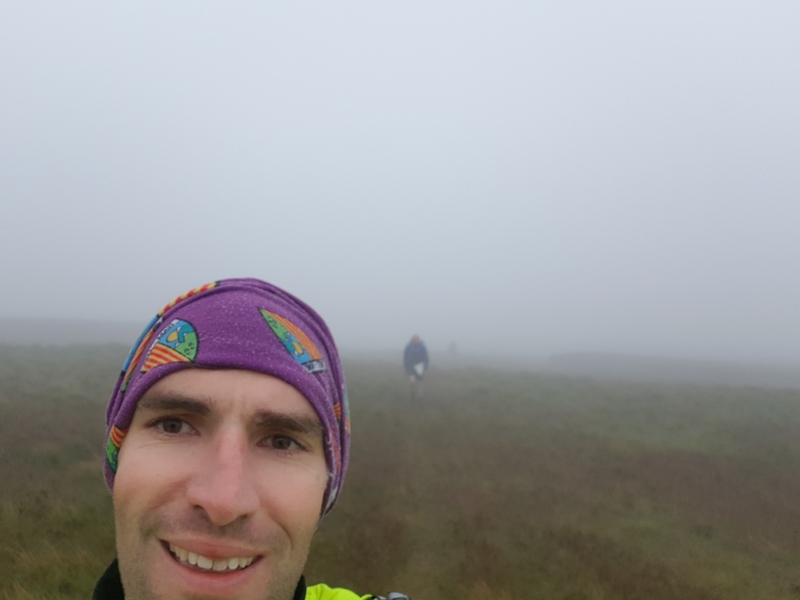 It got cold up top on the plateau, a westerly wind was heavy with moisture, so I was getting wet but still happy in my shorts. Hat & gloves went on, as it was chilly. It just shows how mountain weather can really differ from the calm conditions down at the start. After some gradual climbs on fire road we moved out to open mountain. Normally this would be pure bog underfoot, but it was remarkably firm, which helped our pace. It was disorientating being in cloud cover. Luckily, I didn’t have to navigate, as I just followed the leader. It would be much slower, if I had to check my bearings every so often. I did have a compass & map. Although a handy phone app called ViewRanger did an excellent job – in locates you on the OSI 1:50,000 discovery series maps, so you can zoom to exactly where you are and if you have a pre-loaded route, it would tell you if you’ve gone off-course. Enjoying the day, we stopped after 2.5 hours for a quick sandwich and drink. The scenery was coming through. Corrie lakes below and heather covered raised bog ahead. We crossed the Nire Valley and I was motoring along with Andy from Wicklow. We had a great chat about the mountains, hiking in Chamonix and around Ireland. We met another interesting guy, Cesar from Killarney, via Alicante. He’d started out in Kerry recently with his own hiking guide business. It was nice to talk to him in Spanish for a while. Fair play to him, going from a job in Tesco Bishopstown to making his dreams real by working outdoors. The final descent into Clonmel was lovely. Great views of the Suir Valley, Slievenamon, Bulmers factory & orchard and even a Marian shrine and cross on the last hill. Overall, I really enjoyed the day. It got me motivated to do some longer hikes. It’s different than running, not easy but very accessible to all ages. Thanks to Ger for organizing and respect to those who did all 3 days. My legs are sore after one day, so I can’t imagine 3 days, climbing the Knockmealdowns, Galtees and Comeraghs. Maybe one for 2019.